The Henry Clay Frick residence designed by Carrere & Hastings c. 1914 at 1 East 70th Street in New York City. 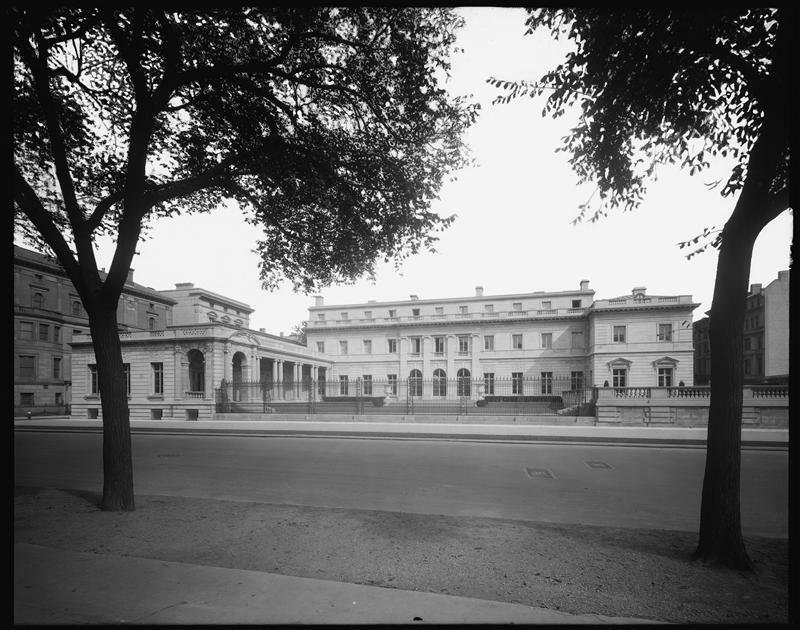 Since 1935 the residence has operated as The Frick Collection. Click HERE and HERE for Christopher Gray's Streetscapes articles on the house. Click HERE to see the Frick residence on google street view. Photo from the Museum of the City of New York. Hmmm ~ the windows of Mr. Frick's bedroom, and bathroom, were open when the photographer took his picture. Could Mr. Frick have been in residence that day or, perhaps, the chambermaids were cleaning the rooms. The top of Henry A. C. Taylor's McKim, Mead and White-designed house is visible above the art gallery wing, and there is a good view of the house at the corner of 71st. Street that preceded Mrs. Twombly's Warren and Wetmore-designed palace-to-be. This is a monument to Mr. Frick's business acumen and splendid taste in art! Parisian in every detail, yet even in this quiet scene (when was the last time one ever so Fifth Avenue looking so serene--like NEVER), yet no place else but New York. 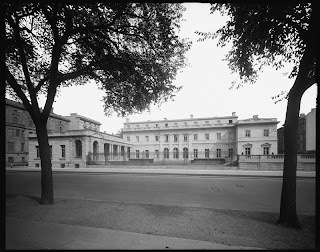 Frick was very concerned that he would not live long enough to see his mansion completed, but consequently , after his death, his mansion underwent numerous architectural changes by one of faves John Russell Pope, to it's rear courtyard. The detailing of this mansion is very exuberant, especially the gates and sculptural decoration.